For most people, a trip to Hawaii in February is an ideal vacation. 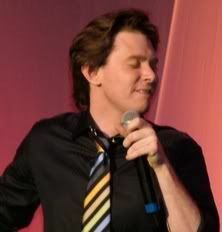 But to Clay Aiken, it was all business when he visited Waikiki in 2005. Clay was in Hawaii to be the keynote speaker at the 21st Annual Pacific Rim Conference on Disabilities. The event was sponsored by the University Of Hawaii Center on Disability Studies. But on February 25, 2005, three days before the conference, the Bubel/Aiken Foundation held an event called “Voices for Change”, a gala dinner/fund-raiser at the Sheraton Waikiki. Clay wore two hats that night. He was a performer, singing five songs from his Multi-platinum album and then took on the role as an advocate for the Inclusion of All Children. On the 4th anniversary of the Voices For Change in Hawaii, it is wonderful to look back and see how well Clay has been able to juggle his commitments to TBAF with the demands of his entertainment career. Congratulations, Clay, for all you have done for children all over the world. When I started reading this, I was thinking to myself…oh yes…I remember this… His first trip to Hawaii…I believe his grandmother (Amaryllis) was there as well. I am very proud of Clay for his work with children. TBAF is a wonderful charitable organization that has benefited both children with and without disabilities. 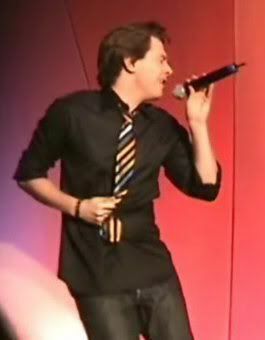 Clay Aiken is making a difference!! What a perfect answer to biggest challenge question, it applies to so many things in this world. Clay Aiken is one very intelligent man. Thanks for this article. I still remember listening to his speech from that conference (downloaded it and listened). Was so impressed with him and continue to be in awe of all the good he does. I remember someone sending this to me as a new fan and thinking Good Lord, this man really does everything! He is certainly making a difference in the lives of many children. Error: Error validating access token: Session has expired on Tuesday, 21-Aug-18 16:13:01 PDT. The current time is Thursday, 25-Apr-19 06:47:50 PDT.